Growing up in the Midwest, I was never a biscuit aficionado. There was a good reason; the only biscuits I ever tasted were the kind that popped out of a tube. You know, the ones found in the dairy section of every local grocery store. 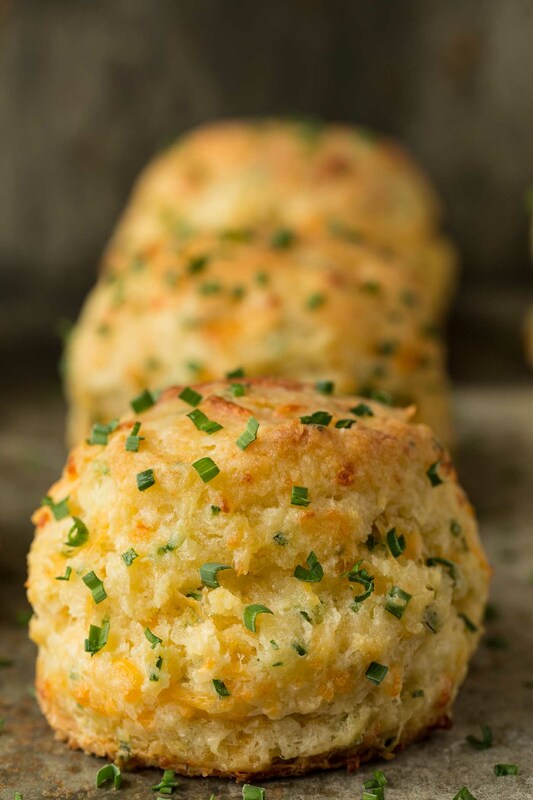 They were nothing like these tall, flaky, Ridiculously Easy Cheddar Chive Biscuits that will melt in your mouth and have you smitten with the first bite! All that changed when Scott and I moved to North Carolina in the early 80’s. At first, we laughed when we discovered that, in the South, there were entire restaurants devoted just to biscuits! How crazy is that, we thought. But the laugh was on us, because when we tasted our first southern biscuits (at a fast food chain, of all places! ), we loved them. We had to (literally) eat our words. The biscuits were tall, flaky, super light and incredibly delicious. My mom was a big bread maker so I was familiar with yeast baking, but not biscuit making. I tried the “biscuit thing” a couple times over the years, but the results were not stellar (at all). I began to think that perhaps you needed a bit of southern lineage to a be a good little biscuit maker. Easier, quicker and just as delicious! But a few years ago, I discovered an amazing technique created by the smart folks over at Cooks Illustrated. They figured out a way to simplify biscuit making that blew me away the first time I tried it. The traditional biscuit technique calls for combining flour with baking powder, baking soda and salt, then “cutting” in cold butter with a knife, a pastry cutter or between your fingers. The liquid is then added and everything is gently combined. If done correctly, the tiny pieces of butter are evenly distributed throughout the flour mixture, giving classic buttermilk biscuits their lightness, flakiness and layers of peelable, buttery deliciousness. This might not seem like a difficult task, but it was one I just couldn’t seem to master. The Cook’s Illustrated technique is totally different… and ridiculously easy! The first time I tried it, I squealed a little when I opened the oven door to check my biscuits. Tall, golden, beautiful biscuits greeted my eyes and I’ve had the same results every time since. These days, I’m feeling like a bona fide southern girl, finally a legitimate biscuit maker! What’s the technique? So easy! 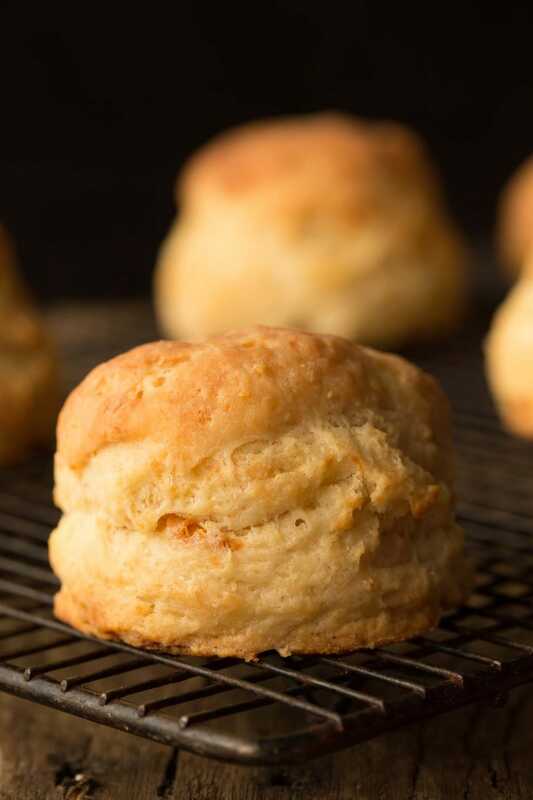 Just place a cup of buttermilk (one of the secrets of delicious biscuits) in the freezer for a few minutes while you melt butter in the microwave. Let the melted butter cool while stirring together the dry ingredients. The melted butter is then combined with the super cold buttermilk. This is where the magic begins! When the warm butter hits the cold liquid, small, buttery globules form. When this buttermilk mixture is added to the dry flour mixture and it’s all stirred together, you’ll notice tiny pieces of pale yellow butter dotting the simple dough. Yup, it will look just as if you spent the time to cut them in! I shared this technique several years ago in this post called Ridiculously Easy Buttermilk Biscuits. In my family, I am the biscuit baker. Everyone asks me to bring biscuits to family events. I tried your recipe yesterday for Thanksgiving – oh, my! I have a new recipe. What a hit! These biscuits are genius!!!! I have tried making biscuits twice in the past (using other recipes) and they have not risen at all…more like hockey pucks than biscuits and I followed the recipes exactly. However, when I tried your recipe today, the biscuits turned out fantastic! 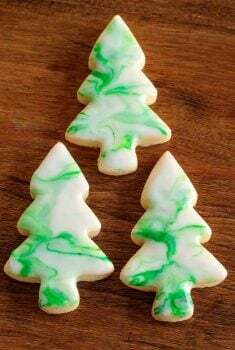 I have made these a few times and I am amazed at how much easier the buttermilk and butter method is compared to cutting in butter which I never really liked doing. Definitely the easiest recipe for biscuits I ever used, excellent!! I did the same thing you did; I got up and ran to the kitchen after reading your recipe/method! With one difference: I’m Dutch, live in the Netherlands and it happened to be 4 a çlock in the night and I couldn’t sleep… So I had an early breakfast… Thank you thank you for sharing this recipe. Here in Holland people are not familiar with biscuits and we don’t eat bread with our supper unless we eat chili or soup… but I after eating them in the States AND watching “the Waltons” a lot I always wanted to make them. They Always turn out tough or dry! I altered your recipe a little… I only put in one teaspoon of Sugar and perhaps a little extra buttermilk because it seemed to dry at first. And I was afraid of kneading it too much, so I just picked up the dough, put it on some flour and formed a disk and cut them out. 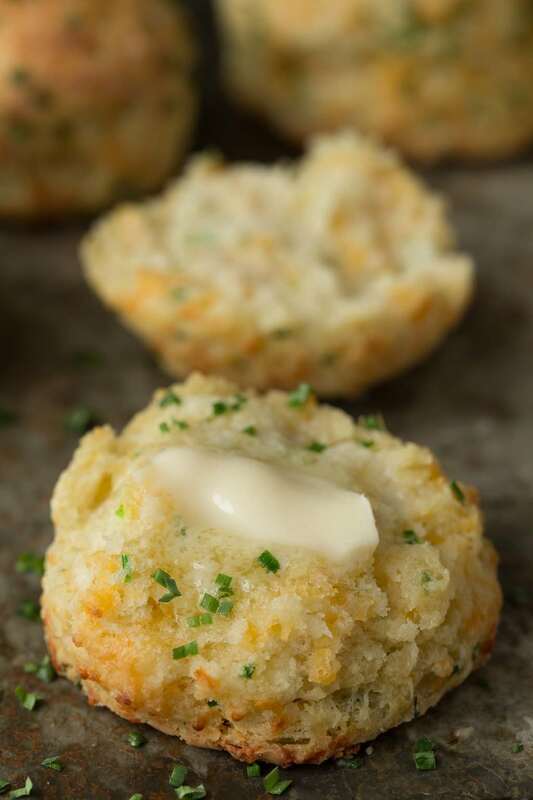 Ridiculously Easy Cheddar Chive Biscuits, brand new clothes for an old classic! For these Ridiculously Easy Cheddar Chive Biscuits, I decided to adapt the original recipe to include cheddar cheese and finely sliced chives. Oh my! Another delicious biscuit, perfect for serving with soups, salads and/or just about any main entree. It’s just as easy as the original recipe, the cheese and chives are simply added with the dry ingredients. Just like in the original recipe the final step is a brush of butter just as the fragrant biscuits emerge from the oven. Pick up some cheddar cheese and a bunch of fresh chives next time you’re grocery shopping. If you’re like me, you might want to run to the store right now! 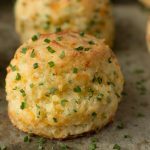 It will take less than 15 minutes to throw these amazing Ridiculously Easy Cheddar Chive Biscuits together. Your kitchen will smell incredible, and you too might find yourself squealing a bit when you open the oven door! You can use packaged shredded cheese or shred your own. Either way, make sure it’s finely shredded. The biscuits will come out prettier that way. If purchasing fresh chives at the grocery store, you may find them in nice big bunches in the produce section. Most of the time however, they’ll be sold with other herbs in little plastic packages. One package should be fine. If it’s not quite 1/4 cup, as the recipe calls for, you’ll still have delicious results. Don’t have any buttermilk? It’s easy to make your own. Place 1 tablespoon of fresh lemon juice or vinegar in a measuring cup. Fill with milk to measure 1 cup and stir well. Allow mixture to sit for 5-10 minutes or until slightly thickened. The mixture may curdle a bit, that’s okay! Use in recipes in lieu of buttermilk. 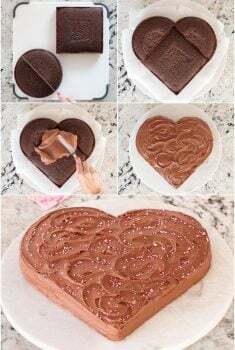 Biscuits can be cut with aluminum cans, overturned glasses, and even Mason jar rings, but using these types of cutters (with rounded edges) can compress the sides of the dough and lead to misshapen biscuits. For tall, beautiful biscuits, use a sharp rimmed cutter. I really like the ones that have a little handle to hold on to (see picture below). 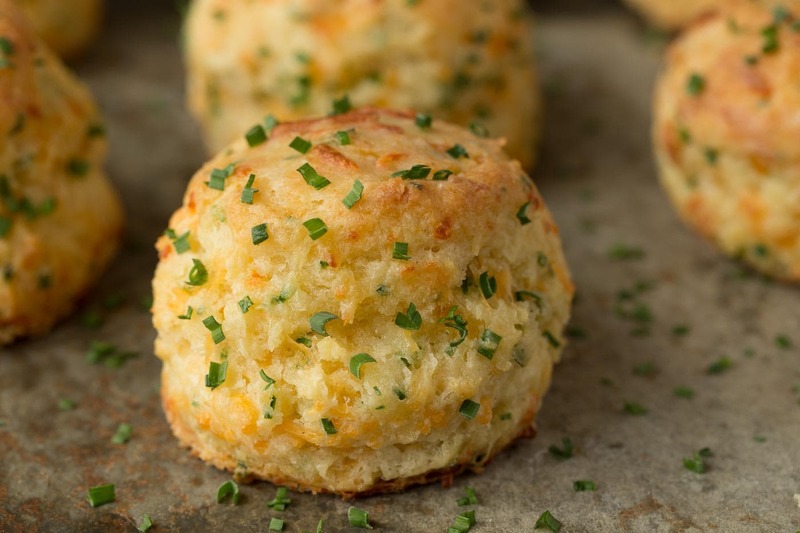 You can make these Ridiculously Easy Cheddar Chive Biscuits any size you want. Miniature ones are really nice for a dinner party, but if you’re making breakfast or lunch sandwiches, larger biscuits are nice. I love these sturdy but reasonably priced biscuit cutters that come in a set of four, allowing you to choose any size you want. Don’t skip chilling the buttermilk (step 2). It’s one of the secrets to good success in this recipe. If the buttermilk is not really cold, the little butter globules won’t form. If you add the melted butter to the cold buttermilk and you don’t see the little butter globules, your buttermilk may not have been cold enough. You can remedy this by placing the mixture in the freezer for another 5-10 minutes, then stir again and you should see the magic globules. I made the original Ridiculously Easy Buttermilk Biscuits several years ago while visiting my daughter in London. I learned the all-purpose flour (Plain flour) in Britain is a bit different and it seemed that I needed more, probably closer to 2 1/4 cups. These Ridiculously Easy Cheddar Chive Biscuits freeze well. If freezing for later use, underbake them by a few minutes, then cool completely. Then place the biscuits on a sheet pan or a plate. Freeze till frozen, then transfer biscuits to a ziplock bag or air-tight storage container. If I’m feeling a bit pinched for time or just plain lazy, I’ll just pat the dough into a 6-inch circle and use a bench scraper to cut the dough into wedges. I either put these wedges on a sheet pan lined with parchment paper or in a 9-inch cake pan lined with parchment. 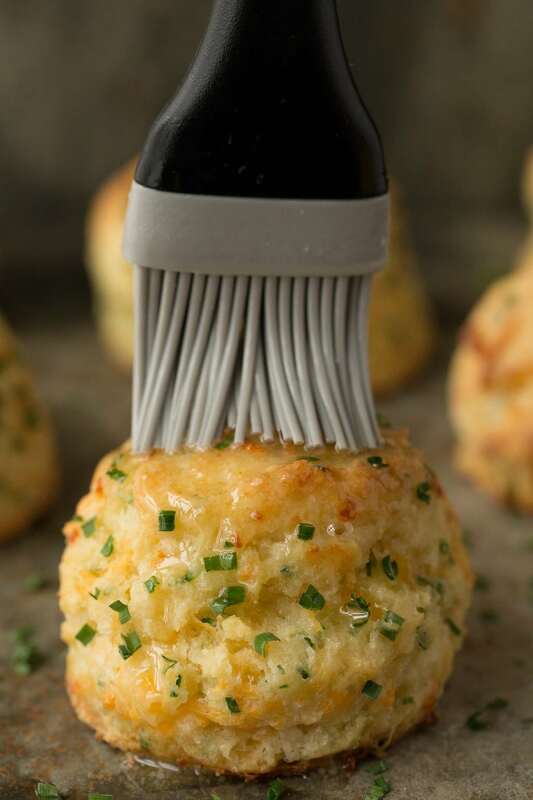 These tall, flaky, Ridiculously Easy Cheddar Chive Biscuits are melt-in-your-mouth-delicious. They'll have you quite smitten at the first bite! Adjust oven rack to middle position and heat oven to 425°F. Line a sheet pan with parchment paper or spray a sheet pan with cooking spray. Measure 1 cup of buttermilk and place the cup in the freezer while prepping other ingredients (you want it to be in the freezer about 10 minutes). Place butter in a microwave-safe bowl, cover with a paper towel over the top and heat on high for 30 seconds. If not completely melted, return to microwave for 10-second intervals till melted. Set aside to cool a bit while prepping other ingredients. Whisk flour, baking powder, baking soda, sugar and salt in large bowl. Add cheese and chives. Stir to combine. After buttermilk has been chilled in the freezer for 10 minutes, combine it with the melted butter. Stir with a fork until butter forms small clumps or globules. Add buttermilk mixture to dry ingredients and stir with a sturdy spatula just until all flour is incorporated and batter pulls away from sides of the bowl. The dough should be stiff and not super wet. If the dough is wet, add more flour 1 tablespoon at a time, stirring to combine, until dough is fairly stiff. Generously spread flour over your work surface. Dump biscuit dough from bowl onto prepared work surface and turn to coat all surfaces with flour. Knead on counter 5-6 times (about 20-30 seconds). Flip over on work surface to coat with flour then pat into a 6-inch square. It should be 1 1/2-2-inches in height. Cut as many biscuits as you can with a biscuit cutter (this will depend on what size cutter you use). Place biscuits on the prepared sheet pan. Knead scraps a few times till they hold together, then pat into a small circle and cut more biscuits. Transfer last biscuits to the sheet pan, spacing about 1 1/2 inches apart. (See Café Tips in post for an even easier cutting technique). Place in oven and bake until tops are a medium golden brown and crisp, 10 to 15 minutes. Start checking after about 8 minutes, as every oven is different. Melt remaining tablespoon of butter and brush tops of hot biscuits with melted butter. Sprinkle with more finely sliced fresh chives. Serve and enjoy! Recipe adapted from Cooks Illustrated via Serious Eats. I added 1/4 nutritional yeast to enhance that cheesy textire.v Very delicious. Thank you for your alternate method of incorporating butter and milk into the dry ingredients. I’m not very talented when it comes to cutting butter into flour so you’ve redeemed my biscuit making skills! I’m with you, Amy! I love this technique. Thanks for taking the time to leave your review! Loved making these this morning for a hearty Sunday breakfast. My husband said they were the best biscuits he’s ever had! This is the third baked good recipe I’ve made from your site and all were absolutely marvelous. Thank you for sharing your “secret tips” too. I love that you guys enjoyed these biscuits as much as we have! Thanks so much for sharing your review, Lisa! AMAZING!!! Your detailed instructions were spot on – Thank you for that. The biscuits actually were ridiculously easy to make and incredibly delicious. I made them to go along with last Sunday’s dinner. They’re on the menu for this Sunday, as well! A new fav with my family. Thank you so much! I love it! Thanks so much, Brenda, for sharing your results! Hello! Can I freeze them uncooked and then thaw them on room temperature and bake them? Hi Nelly, you can freeze them uncooked but don’t thaw. Just pop them right in the oven and give them a few extra minutes. Hello where can I find the actual video of this recipe? Yes, you can freeze them unbaked. They can go right from the freezer to the oven. They’ll take a few minutes longer to bake but will be wonderful and freezing them will save you last minute stress! Would it be possible to make these the night before and cook the next day? Thinking of adding them to my thanksgiving table. Thanks! Hi Patricia, you can definitely make these biscuits in advance. Just cover well with plastic wrap and store in the refrigerator. They can go right from the fridge into the oven. Enjoy! Great looking recipe. Another technique I use is to just shred a frozen stick of butter and mix with the chilled dry ingredients. Does the same thing I believe. 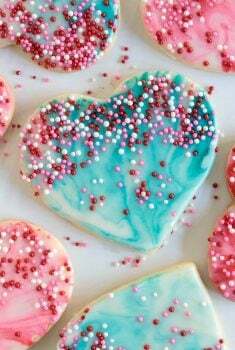 Happy Baking!! 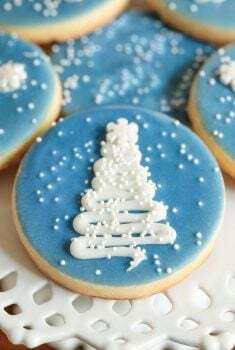 Delicious biscuits. Didn’t have chives do I used dill which works well. That sounds great. I love dill too. Thanks for taking the time to share your results, Laurel! Does the cook time change depending on the size of the biscuit you choose? If you make really large or really small biscuits, it could make a difference. Just use the time in the recipe and adjust up or down a few minutes, until biscuits are golden brown. I would like to know if I could substitute the flour for self raising gluten free flour? Hi Mandi, I haven’t tried that so I can’t guarantee the results. I know you would have to adjust the baking powder because self-rising flour has additional baking powder in it although I’m not sure precisely how much your particular GF flour has. Oh my, these lovely cheese scones are truly a thing of beauty. This is the third batch of buns I`ve made in the last two weeks – trying to replicate a cheese scone in our local bistro that has a fine crumb, can pull apart nicely without crumbling, and tastes great. Your recipe seems to be the closest so far. Tonight I made a beautiful prawn and corn chowder that was an awesome foil to the buns. I may try and add an egg to this recipe, but they sure came out wonderfully tender and light. Thank you!! I just made your recipe…..they tasted so gooooooodddddddd! I did not get the rise as they appear in the picture. I checked all dates on baking soda and powder, all good. Any advice? Hi Barb, the butter might have gotten too warm. Try refrigerating the cut out biscuits for 15-20 minutes before baking. Thank you. I will definitely be making these a lot in future. Love this technique, thanks for sharing. Help! What am KI doing wrong. Splayed out with no rise…. I did not roll the dough and left it really thick. Used a plain sided Cutter, did not twist as I understand this can ruin the rise and too ashamed to photograph them. Taste wonderful – just look sad. Amy thoughts???? Hmmm… it’s hard to say Kaye without being with you. I haven’t ever had that problem and I’ve used this recipe a lot. Sounds like you did everything right. Could your baking powder be old? Excellent, thank you! For other users, I made this recipe using partially dried chives and I did slightly more than a 1:2 ratio fresh to partially dried and that worked well. My family and friends can’t get enough of it and I’m sharing this recipe constantly. Do you happen to have a recipe variation for these biscuits to make sweet ones? Like cinnamon raisin or lemon peel? These are awesome btw… I have made them twice in one week! I have the biscuits in the oven. They don’t need any eggs? I have a scone recipe that is very similar but it definitely needs an egg.